WHEN I DECLINED the camel ride attraction, my tour guide took me by the elbow and tried to sell me to some Arab merchants standing nearby. “What will you give me for her?” he asked them. As members of an “archaeological study tour,” we were not quite as gullible as many modern pilgrims. We met grandiose historical claims with cheerful skepticism. But we were pilgrims nonetheless, following the trail of biblical sites, collecting our souvenir olive wood communion cups, and singing hymns on the bus. It was often hard to strike a spiritual mood amidst the political graffiti, falafel, bargain packs of postcards, and T-shirts urging “Shabbat: Just Do It,” but we tried. The first time I knew for sure that this trip would be worth the itchy passport pocket around my waist was when I stood looking out over the Sea of Galilee at sunset. I could imagine a small fishing boat out there and a dark figure walking towards it over the waves. But the pinnacle, for me, was sitting on the Herodian steps of the Temple Mount in Jerusalem. In all of Israel this was the one place where I could be certain that I was sitting where Jesus had walked. 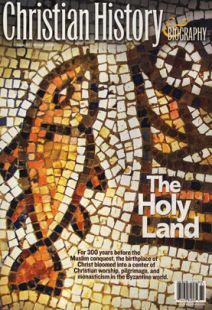 “No other sentiment draws people to Jerusalem than the desire to see and touch the places where Christ was physically present, and to be able to say from their very own experience: ‘We have gone into his tabernacle, and have worshipped in the places where his feet have stood.’” Paulinus of Nola said this in the fifth century, and our fascination with the homeland of Jesus still draws millions of Christian travelers to Israel. We ride in cars and buses; earlier pilgrims walked or rode camels. And it’s been going on for two thousand years. That’s a lot of camels. But those early pilgrims had another goal besides seeing the holy places; they wanted to meet the Christians who lived there. They went not only to honor the tomb of Christ but to worship with the living Body of Christ.